WASHINGTON – By a 62-37 vote on Apr. 25, the Senate approved a modified postal “reform” bill, S1789. Union leaders called it an improvement over the original version, but say it doesn’t go far enough in relieving the U.S. Postal Service of the onerous financial weight the agency labors under – weight that led postal officials to plan to fire more than 100,000 workers, let another 100,000 go by attrition, and kill Saturday delivery, among other measures. “Keep your chins up, brothers and sisters; this fight is far from over,” said Letter Carriers President Fredric Rolando after the final vote. 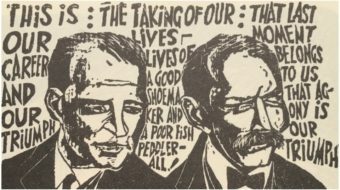 The NALC led mass public mobilization for alternatives to S1789, and the Mail Handlers – a Laborers sector – also fought the original bill, as did the Postal Workers (APWU). The battle over the future of the Postal Service now moves to the GOP-run House, where anti-worker Rep. Darrell Issa, R-Calif., chair of the panel that oversees the USPS, has so far unsuccessfully pushed his own “reform” legislation. Issa would impose a financial dictator or board on the agency that could unilaterally raise rates, close post offices, fire workers, and tear up the postal unions’ contracts. Retaining overnight delivery standards for first-class mail for much of the country. USPS wanted to dump all overnight delivery standards and use that to close 252 processing centers, half of those functioning. The closures are delayed, too. Establishing an independent commission to suggest new business areas the USPS can enter to help it make money. Returning $11 billion in pension money USPS overpaid into the Treasury in the past years, and a reduction in the agency’s annual pre-payment for future retirees’ health care costs. A GOP-run Congress in 2006 imposed that $5.5 billion yearly pre-payment at the behest of then-President George W. Bush. Without it, the NALC contends, the postal service would have virtually broken even, despite the recession and the inroads of the Internet. Banning closure of post offices in areas without significant broadband access to the Internet or where the closure would harm small businesses or prevent seniors from getting prescription drugs. Sen. Rand Paul, R-Kent., tried to completely ban collective bargaining for any USPS employees, thus immediately killing the unions’ contracts. He lost 76-23. All 23 Paul supporters were Republicans, including Senate Minority Leader Mitch McConnell, R-Kent., and former GOP presidential nominee John McCain, R-Ariz. Tea party leader Sen. James DeMint, R-S.C., tried to insert a “paycheck protection” provision into the bill, throwing unionists out of politics, just as tea partiers and their radical right allies have done in several states. DeMint lost on a 53-46 party-line vote, with all the Republicans supporting his stand. 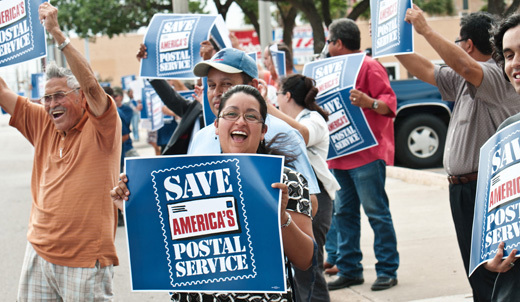 Despite the changes, the union leaders said the rewritten S1789 does not go far enough to solve the USPS’ woes. Rolando gave full credit to Sanders for leading the fight for workers within the Senate, then pivoted. “Despite the truly regressive nature of the House Republican bill, HR 2309, the NALC’s top priorities-preserving six-day delivery and fixing the pension and health care funding provisions-have a lot of bi-partisan support” there, he said. Rolando promised NALC would conduct “a spirited campaign” for those sections in particular and the Senate bill in general when the GOP-run House tackles the postal service’s future. He added the union’s drive would continue when bargainers from both houses of Congress eventually meet to hammer out a final version of the legislation. “A majority of representatives support both six-day service and pension equity,” Rolando pointed out. The Mail Handlers “relied on many of its friends and supporters in the Senate to help shape a more favorable bill, but special credit goes to Sanders, who created a coalition that was successful in securing countless positive changes to the original version,” the union said.